What are the most 29 useful websites ? Here are the most random useful websites on the internet. That may help to you to learn any new technology or any new things. 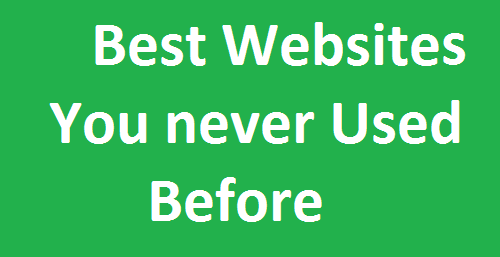 i this article we are showing 29 best useful websites. 1. Flight Status : track the required flight status at airport in any where in the world. 2. Unsplash : we have so many websites to download the images for free. up-splash is one of the most useful website to download the good images for free. 3. Join : join.me is one best website to share the screen with any one with over the internet. 4.google fonts : the best open source for fonts, you can find the nice collection here. 7. net meeting: bets net meeting portal for free. you join with group of peoples. 8. file convertionv: it is one of the most useful website to convert our need. this portal provides the various tool below listed. 11.Kleki : we have so many websites on paint in my point of view the best websites to create you art from heart. you can paint here with different brushes. 12. ge : you can share the files through this website and before download we can preview. 14. FileFizza :Peer to Peer file transfer without any middleman with real time communication over Web RTC. if you full information about webrtc you can visit the link. 15. translate-google : here you can translate the PDF's, web pages, Documents for free to any language. 16.Buffer.com : one of the best website for business mans or who is working in digital marketing, or any other activities one update. they provide 3 social accounts for free. if you want more than 3 accounts then you should go for premium. 17. todaysparent.com : the best website for parents to get tips on parenting. 18. historytoday.com : you can get the today's history. one of the best worlds magazine and the Alexa rank is 88901 in 2018. 20. carbonbrief.org : if you are lover of nature then go for carbonbrief website to get the news on climate related. 23. outsideonline.com : we have so many websites on travel but this website cover the travel, sports, fitness, health, personalities and the style and culture. 29. 10minutemail.com : one of the best website for temporary mail for SEO or any other things. by using this site we can save from spam in our original mail. it is one most useful website rank is 18748.
we will post the more and more on " best useful websites ". if you like this best useful website article please share to your friends.